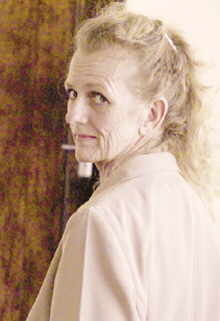 On this date in 2001, Botswana secretly hanged creepy South African emigre Mariette Bosch for whacking her neighbor in order to steal the neighbor’s husband. That the black widow was actually white only threw the lurid scenario into sharper relief. In the well-heeled enclaves of Gaborone, one Ria Wolmarans was found shot dead in 1996, and inside a month her former husband Tienie Wolmarans had moved in with Mariette Bosch. The big break in the case came from Mariette’s sister Judith, to whom the murderess had unguardedly confided her love for Tienie prior to the shooting. (The lovebirds’ official story was that their loins only heated up as Ria Wolmarans’ body cooled.) Judith got ahold of the 9mm Mariette had borrowed and handed over to the police what proved to be the murder weapon. Although the courts found Mariette’s erratic defense — something about hypnotism and her victim’s boss — absurdly implausible, her elite status helped make her the lightning rod for capital punishment in Botswana. The international attention she attracted, however, simultaneously pressured the government to close the books with a very speedy hanging. Bosch was hanged at 6 a.m. this date upon 24 hours’ notice to herself and none whatsoever to the outside world: Tienie — who always avowed disbelief that Bosch killed his wife — was turned away from the prison on what he figured was a routine visit the previous day, and found out about Bosch’s execution with the rest of the country when it hit the news two days later. Bosch had to go her last day on earth alone.